Versions of the Saleae Logic Windows software starting with 1.2.11 require the Microsoft Visual Studio 2015 runtime to be installed in order to work. This is installed automatically when the software is installed. If you are using the standalone version of the software on Windows, it needs to be installed manually. If you see either of the below errors, it is possible that the runtime is not installed properly. "The program can't start because api-ms-win-crt-runtime-l1-1-0.dll is missing from your computer." "The program can’t start because vcruntime140.dll is missing from your computer." Uninstall and re-install the Logic software. Be sure to select the x64 version if you are using a 64-bit version of Windows. After you have installed the runtime, try restarting the computer and running Logic again. If the above steps don't solve the issue, please try installing and running version 1.2.10 of our software. You can find it below. The version of Windows you are using and if it is 32-bit or 64-bit. Let us know if the computer is connected to the Internet and updated regularly or if Microsoft updates either can’t be installed or haven’t been installed for a long time. If updates are available, we recommend you install them. Open “Programs and Features” from the control panel or by searching for it on the Start menu. 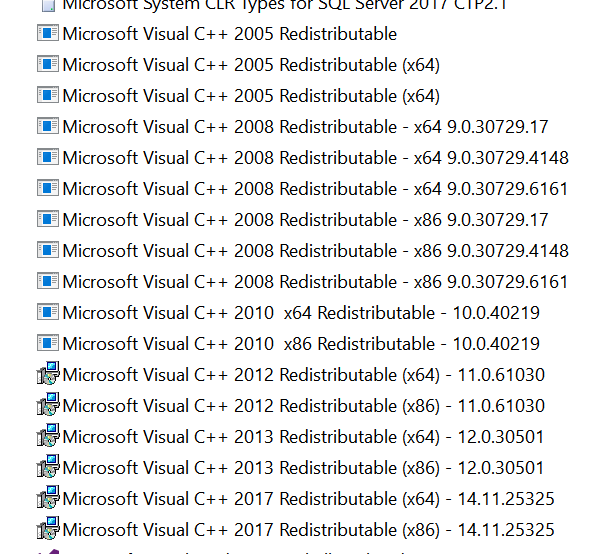 Scroll down to find one or more items labeled “Microsoft Visual C++ 20XX Redistributable.” Take a screenshot of all the items listed with this name and send it to support.